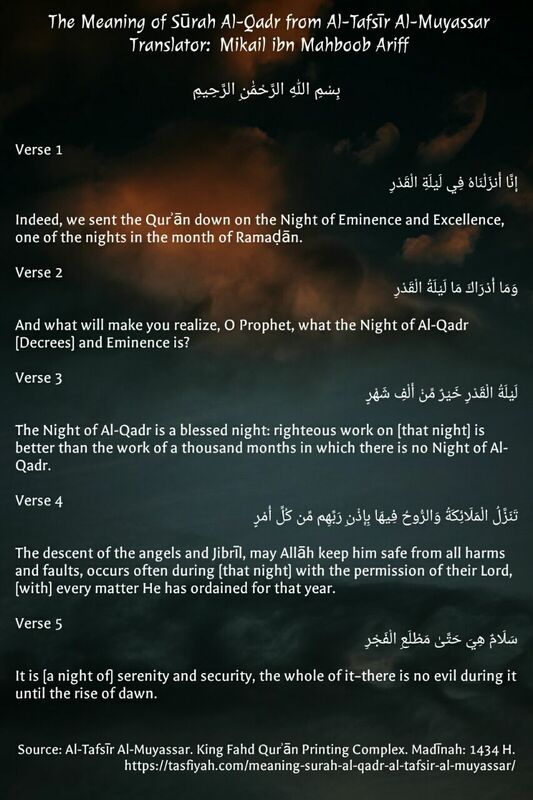 Can you explain some of the signs of Laylatul Qadr [the night of Decree]? The signs which indicate Laylatul Qadr which have been mentioned by the Prophet (sallAllahu ‘alayhi wa sallam), I can recall at this moment the following. The first of them or number one is that Laylatul Qadr is a peaceful, tranquil quiet night. Within that night or the night of Laylatul Qadr you do not hear the barking of dogs, or the sound of the cockerel. The second sign is that in Laylatul Qadr the people experience a pleasant breeze or a pleasant wind which they enjoy which they like. Thirdly, in Laylatul Qadr there is rain. This is one of the signs of Laylatul Qadr that during the night of Laylatul Qadr the rain falls. Fourthly, is that when the sun rises on the following morning the disc of the sun is seen without strong rays or is without any rays. The disc is a clear disc when it rises in the morning. The Shaykh said many of these signs the people notice them or they see them and if we notice these signs, then we should have glad tidings in the hope that we have coincided with Laylatul Qadr. In the name of Allah, the Most Gracious Most Merciful. 2. 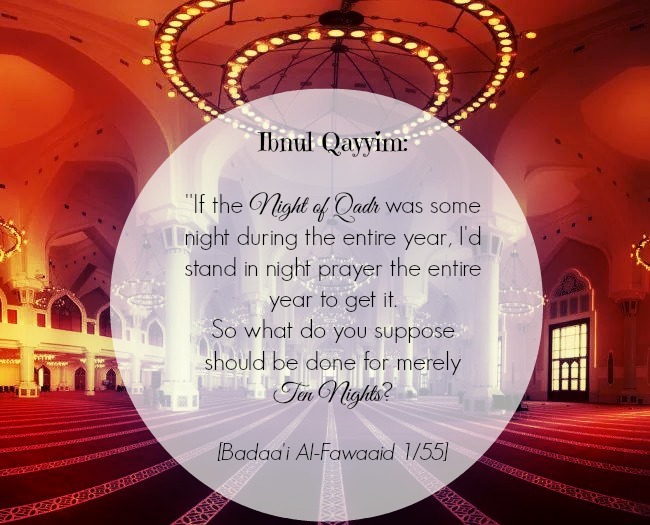 And What will make you know what the Night of Al-Qadr is? 3. The Night of Al-Qadr is better than a thousand months. 4. Therein descend the angels and the Ruh by their Lord’s permission with every matter. 5. There is peace until the appearance of dawn. The Night of Al-Qadr is better than a thousand months. Therein descend the angels and the Ruh by their Lord’s permission with every matter. meaning, the angels descend in abundance during the Night of Al-Qadr due to its abundant blessings. The angels descend with the descending of blessings and mercy, just as they descend when the Quran is recited, they surround the circles of Dhikr (remembrance of Allah) and they lower their wings with true respect for the student of knowledge. In reference to Ar-Ruh , it is said that here it means the angel Jibril. therefore, the wording of the Ayah is a method of adding the name of the distinct object (in this case Jibril) separate from the general group (in this case the angels). There is peace until the appearance of dawn. With every matter, there is peace until the appearance of dawn. This chain of narration is good. In its text there is some oddities and in some of its wordings there are things that are objectionable. The men of this chain of narration are all reliable, but Abu Dawud said that Shu’bah and Sufyan both narrated from Ishaq and they both considered it to be a statement of the Companion (Ibn Umar, and thus not the statement of the Prophet (Sallallaahu ‘alaihi wa Sallam) ). In one narration it adds that this occurred on the morning of the twenty-first night (meaning the next morning). They both (Al-Bukhari and Muslim) recorded it in the Two Sahihs . 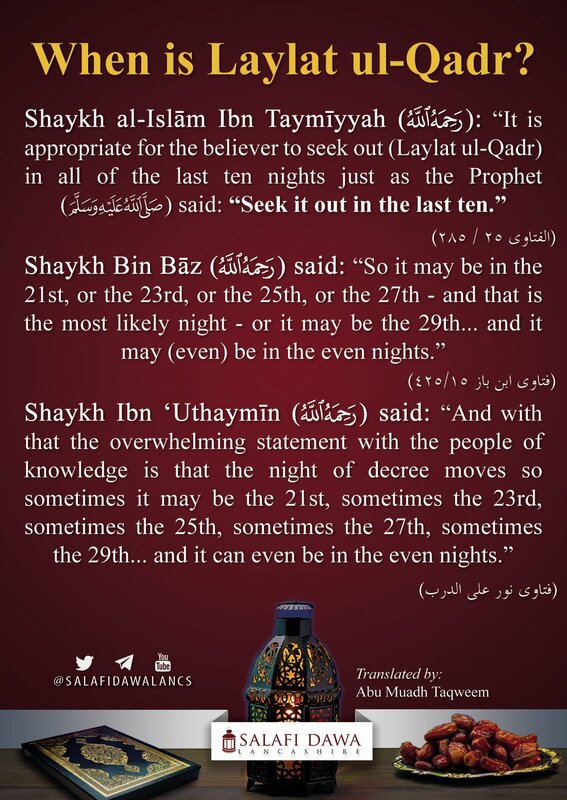 Many have explained this Hadith to refer to the odd nights, and this is the most apparrent and most popular explanation. It has also been said that it occurs on the twenty-seventh night because of what Muslim recorded in his Sahih from Ubay bin Ka’b that the Messenger of Allah (Sallallaahu ‘alaihi wa Sallam) mentioned that it was on the twenty-seventh night. Ahmad was alone in recording this Hadith and there is nothing wrong with its chain of narration. At-Tirmidhi recorded from Abu Qilabah that he said, “the Night of Al-Qadr moves around (i.e., from year to year) throughout the last ten nights.” This view that At-Tirmidhi mentions from Abu Qilabah has also been recorded by Malik, Ath-Thawri, Ahmad bin Hanbal, Ishaq bin Rahuyah, Abu Thar, Al-Muzani, Abu Bakr bin Khuzaymah and others. It has also been related from Ash-Shafi’i and Al-Qadhi reported it from him, and this is most likely. And Allah knows best. Al-Hakim recorded it in his Mustadrak (with a different chain of narration) and he said that it is authentic according to the criterial of the two Shaykhs (Al-Bukhari and Muslim). This is the end of the Tafsir of Surah Laylat Al-Qadr and all praise and blessing are due to Allah.